Arvada, CO (March 24, 2013) – After recently receiving their 501(c)3 tax-exempt approval from the IRS, US Warriors Outdoors (USWO) announces its first hunt for wounded veterans. USWO has organized a fully guided and supported turkey hunt for two wounded veterans in Lewellen, Nebraska the weekend of April 19, 2013. "We are honored to offer our wounded veteran heroes the opportunity to reconnect with the outdoors and pursue their hunting passions" said Gene Palumbo, Founder of USWO. "USWO is firmly committed to planning veteran hunts on quality properties and identifying community support for our hunts through partnerships with local business interested in donating their lodging, guiding and food services". The turkey hunt in Lewellen includes two nights of lodging for two wounded veterans and USWO staff donated by Clear Creek Retreat, guiding services for two days provided by Bill Doris and a welcome dinner for staff and hunters donated by Otter Creek Lodge. "It is truly amazing how many businesses and individuals are stepping forward to support our mission: to provide quality hunts for wounded veteran men and women. I am touched by our partner’s generosity and unselfish support" said Tim Thies, Director of USWO. 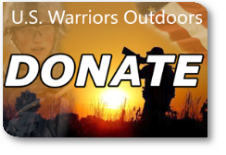 Based in Arvada, Colorado, US Warriors Outdoors is a 501(c)3, committed to providing fully supported quality hunts for wounded veteran men and women and helping to develop a reconnection with their hunting and outdoor adventure passions.